Every winter I work my way through my garden cutting back the year's growth, making way for the next year's. My yard is so small in relation to the number of plants that it's a constant struggle, a continuing dance that never ends. As I cut, I came across several of these pods clinging tightly to the branches of various trees and shrubs. 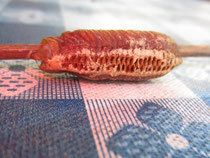 Part honeycomb, part chrysalis....I was flummoxed. I grow Passion Vine specifically to accommodate the Gulf Fritillary, so I'm always on the lookout for chrysalises. Thanks to some far flung face book friends I learned that what I found are the pods that house prying mantis eggs. I have only noticed praying mantis in my yard for the past several years. It started when the little boy next door mailed away for praying mantis eggs, hatched them and then released them into our yards. Each year the mantises that I see are a little bigger, this year I saw one that was about 4 inches long. I need to do some research, but it appears that they have begun to reproduce meaning the neighbor boy has actually impacted my yard's ecosystem! 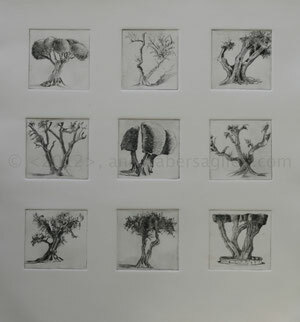 That dance between our random actions and how that effects our little slices of nature is represented in the olive tree series I've been working on for the past few months. Many houses in my town have olive trees and how residents react to this responsibility is endlessly fascinating for me. Is their tree healthy or sick, overgrown or topiaried, nurtured or neglected.....do they house bird feeders or are they cut into the shape of a hedge? The trees are a record of their owners attitude towards their garden. They are a record or their owner's attitude toward nature.